In his book “Fishing From the Earliest Times” – published in 1926 and still widely regarded as the most comprehensive work ever produced on the subject – William Radcliffe quotes the Roman poet Martial, who wrote about fly fishing sometime around 10 A.D. “Who has not seen the scarus (a type of fish) rise, decoyed and killed by fraudful flies?” – though the original was in Latin, obviously! Clearly people have been fooling fish into biting – or at least trying to – for thousands of years and while there’s evidently nothing new about the idea, it is never-the-less a noble and worthwhile art to learn and, more to the point, one that can help you make bigger catches. Over the centuries since Martial watched those anglers beside a river, untold thousands of pages have written about how to tie the perfect fly, or create the ultimate lure, and the appeal of finding “the one” which is a guaranteed fish-catcher is easy to understand. If you look at any plug or spinner it’s clear that while it resembles a natural prey item of some sort, with very few exceptions, it often isn’t even a close look-alike, never mind an exact replica. Even that all-time favourite example in your fishing bag, the one that has caught more than any other you’ve ever owned, isn’t remotely convincing as a large insect or small fish. Yes, it is about the right size and shape, and in the right hands it can be made to behave like the thing it’s pretending to be, but that’s pretty much as far as any concession to looking natural goes. The reason why most lures work largely lies in what biologists call the supernormal – not super-natural – to avoid any confusion with vampires, zombies and other ghostly goings on! It’s not hard to see why. Fish, like other animals, are naturally programmed to respond to certain stimuli – and shape, colour and movement are high on the list. By taking a feature that exists in a normal prey item and exaggerating it, rather like a cartoonist does to draw a caricature, the end result is a lure which doesn’t look like the thing it mimics, but gives out such strong signals that the fish you’re after finds it irresistible. Bright silver bodies, for instance, mimic the flash of a struggling fish, while spots and stripes of colour deliberately make the “prey” more conspicuous than any real creature could ever be. This is the science of the supernormal response – and as any lure angler knows, it works! Attempting to create an ever more tempting lure is, however, only part of the art of fooling fish; the best bait in the world is useless unless it is presented properly, at the right time and in the right place. 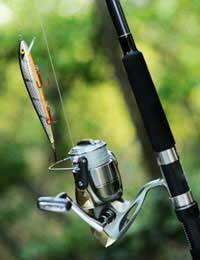 Much of this is, of course, the routine sort of fishing knowledge that every angler builds up over his or her time beside the water – the lore of where the fish will be, when they’ll be feeding and on what. It’s often said that some of the best anglers actually think like fish, and there’s probably a lot of truth in that. The more you understand the ways of fish and how factors such as weather, temperature, time of day and the season affect their behaviour, the better placed you’ll be to fool them into taking your hook, rather than any of the number of natural – and safer – meals on offer. Nature will often provide the clues to help you, if you’re prepared to look. Although many kinds of fish normally have fairly clearly defined food preferences, at some times of the year, this can change and the artful angler will need to take note of this if he or she is going to practise a little subterfuge and take advantage of the situation. On inland waters, for instance, mass insect emergences which may only last for a few days – or even hours – can offer resident fish a bonanza harvest. Use the right fly during this time and you could be well away; the same fly used afterwards will often be ignored. A similar kind of thing can happen at the coast, when storms or surging rivers throw up unexpected food items and various sea-fish capitalise on the new supply. It’s well worth remembering that old saying that you can fool some of the people, all of the time and all of the people, some of the time, but you can’t fool all of the people all of the time. It’s the same thing with fish, so when you come across days when you don’t seem to be fooling any of them and the bites just aren’t coming, don’t despair – just try something different. You might be pleasantly surprised!